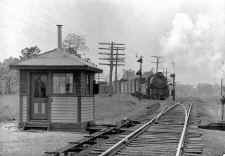 The rider, from Bellport (Montauk Branch), takes the eastbound Montauk, Amagansett or Speonk train and gets off at Eastport. At Eastport, the rider waits for the "Greenport Scoot" heading westbound back up to Manorville via the Manorville branch, then eastbound as the "Scoot" takes the east leg of the wye to the Main Line and out to Greenport, making the stop at Jamesport. 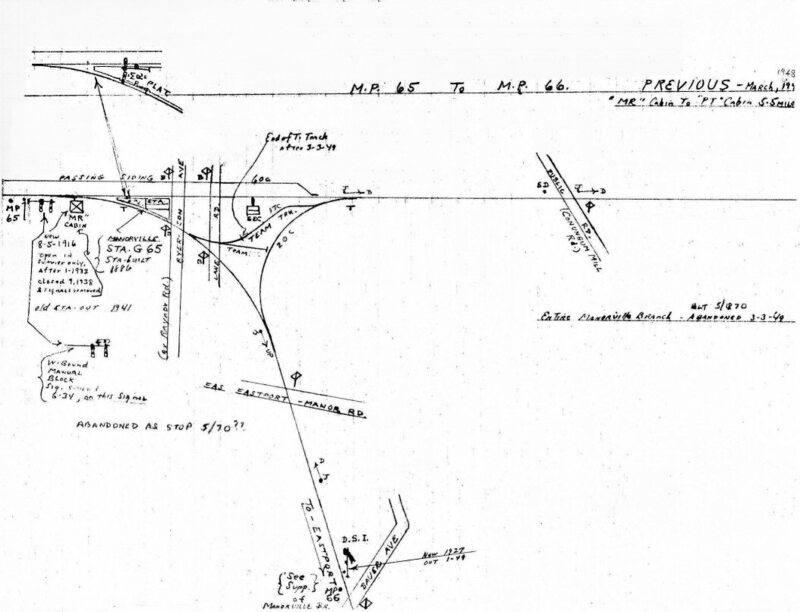 New stop in service: 10/19/1881. Remodeled: 19_? Elevated exterior view from semaphore block signal showing connecting Manorville Branch. 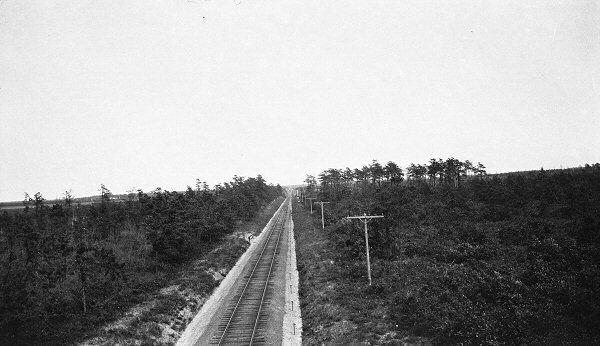 PT cabin viewed from signal mast looking west up the Manorville Branch (straight ahead) with Montauk Branch curving off to the left. MANORVILLE, LIRR MAINLINE: APPEARS ON TIMETABLE OF 6/14/1845 AS “ST. GEORGE’S MANOR” AND IN 1852, SHORTENED TO “MANOR.” RAZED: 9/1869 (Per local history, the first station agent, Seth Raynor, a patriot of the American Revolution, painted out the “St. George’s,” leaving “Manor.”). 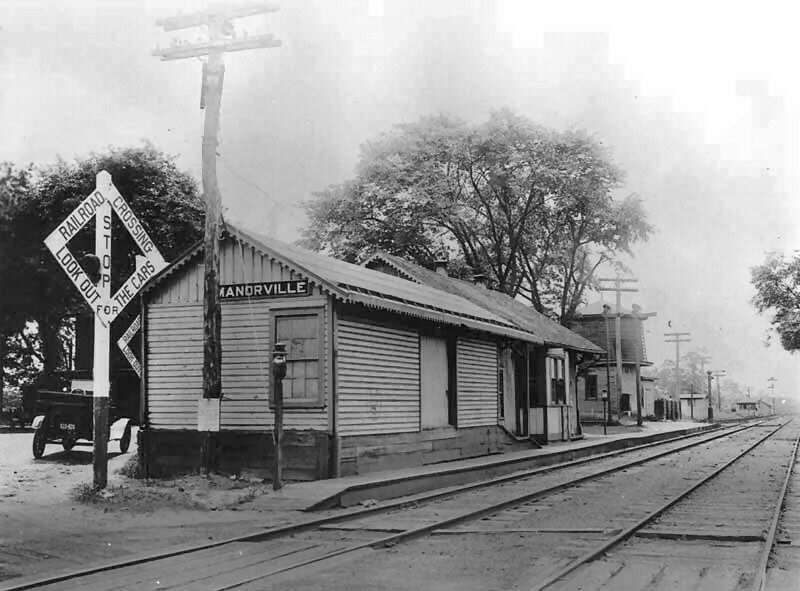 THE TOWN NAME CHANGED TO MANORVILLE WITH THE OPENING OF THE POST OFFICE, BUT TIMETABLES AND LIRR DOCUMENTS RETAINED THE NAME "MANOR" UNTIL C. 1907-1908 PHOTO OF DEPOT TAKEN IN 9/1906 SHOWS “MANOR” STATION SIGN ON SIDE OF BLDG. 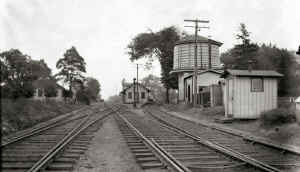 JUNCTION TO EASTPORT WITH NEW BRANCH TERMINATING AT SAG HARBOR CONSTRUCTED: 1870. 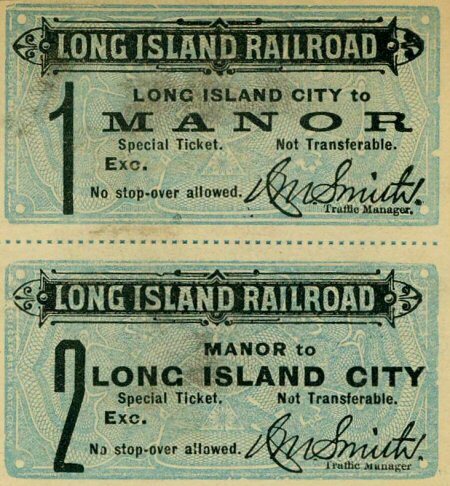 1895 roundtrip ticket from Long Island City to Manor. 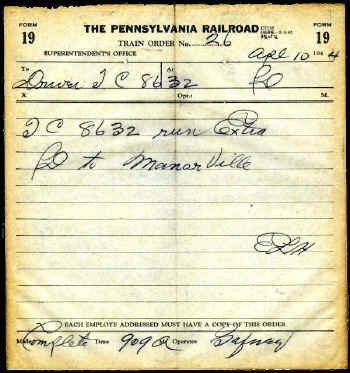 Manorville 4/24/1847 Summer "Arrangement" timetable. A stop here to load wood in the tender for the engines on their trip to Greenport. Zoom view of 9/27/06 photo showing the station sign says "Manor". 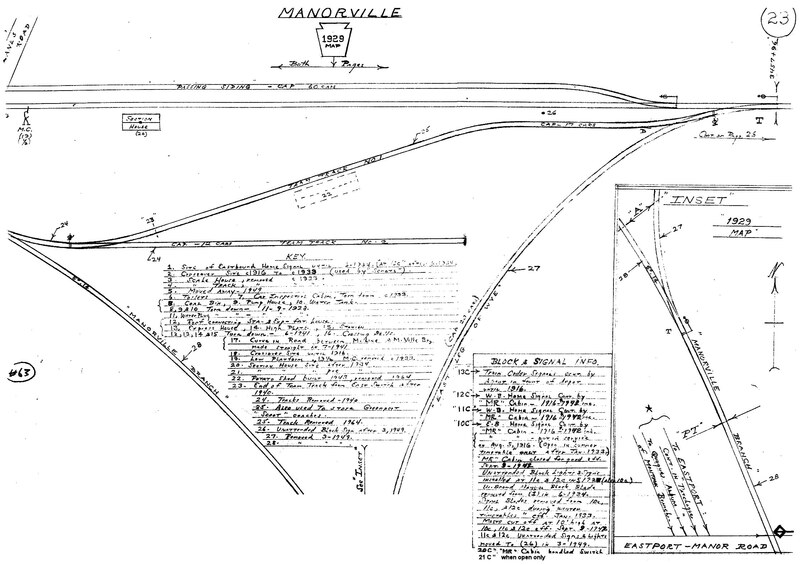 It wasn't changed to Manorville until 1907. 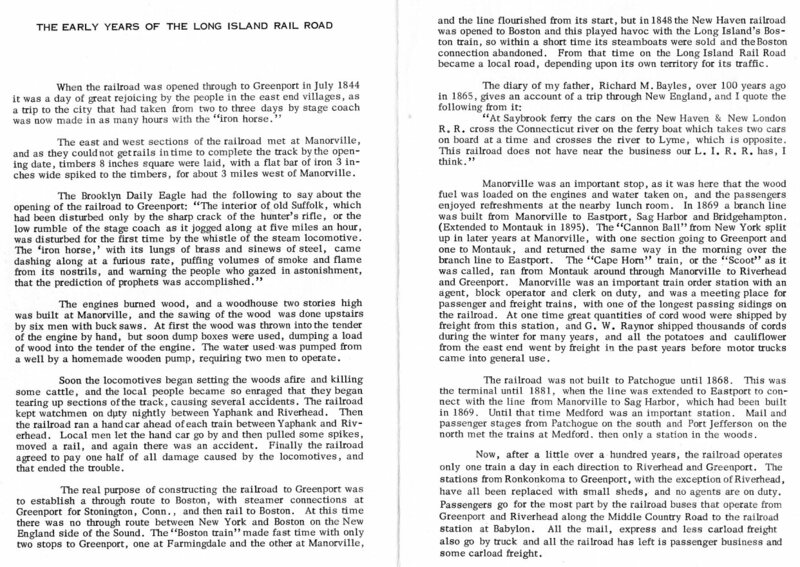 Emery map 1934 Manorville - MP65 to Lanes Rd. 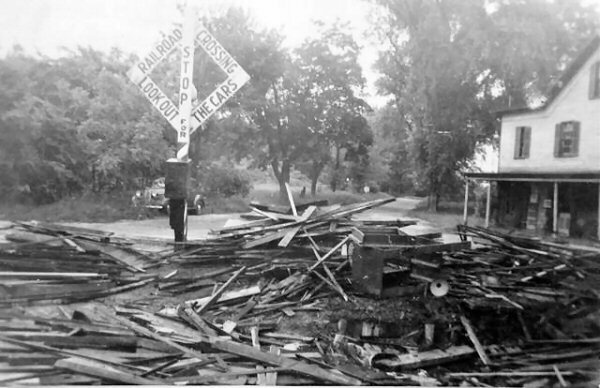 By the time it was demolished in June, 1941, (above right) the ticket agency would have been closed for some time. 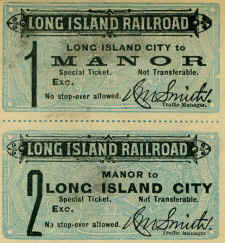 Traditionally, when the LIRR closed an agency, it left the depot remaining for a period of time, for passengers to wait inside. 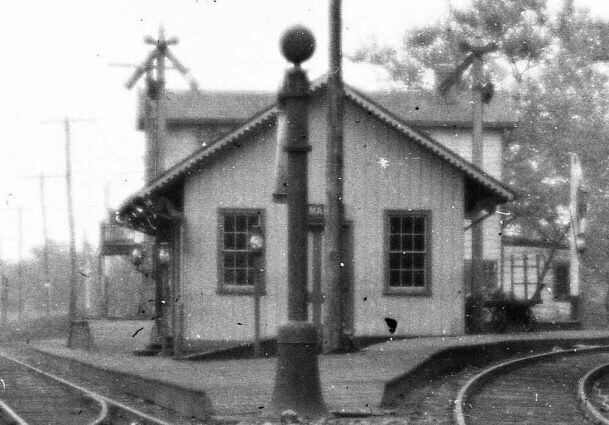 (Yaphank's agency closed in 1958 and the depot remained standing until razed in 1961.) 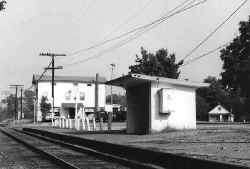 The train crew leaving the station in the evening would be responsible to turn on the platform and station lights and the train crew arriving in the morning would be responsible to turn them off. 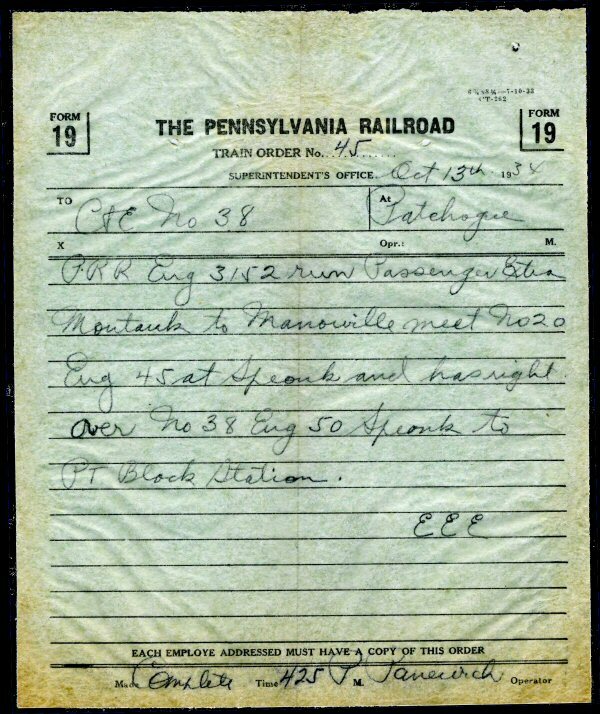 It has been rumored that the railroad station was then moved to inside the nearby hotel. 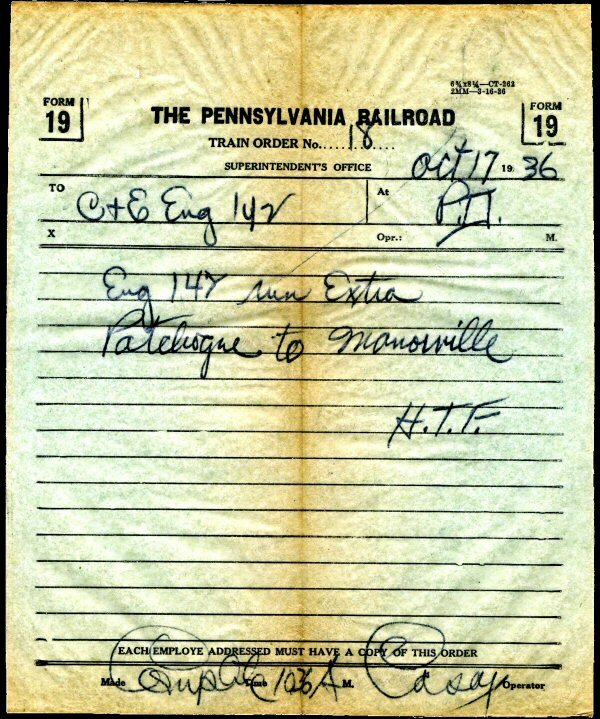 As there was no longer any ticket agency (and freight agency and Railway Express agency) at that location, there would have been no need for the hotel to house the station as there were no ticket sales, no agent and no clerk. As you can see from the images (above center, right), one from 1955 and the other from 1968, the replacement depot was a quickly-put-up cement block structure. I can't see it taking very long to construct. 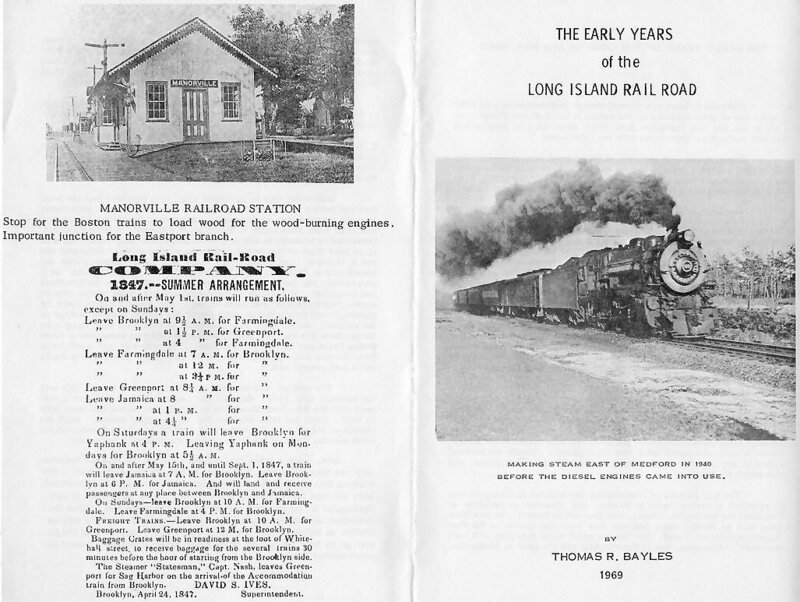 These shots (above left/center) are of the Manorville-Eastport branch. 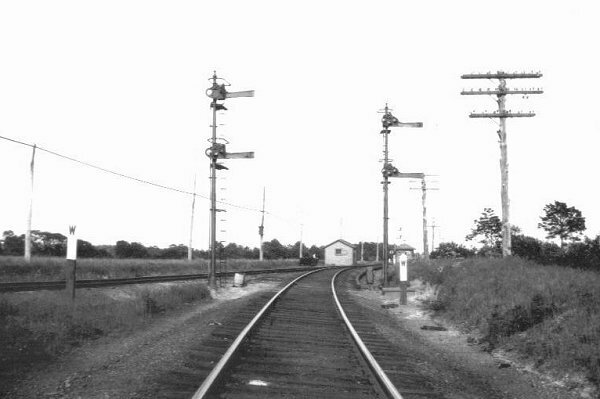 The only signal on the branch was installed on the north side of the Bauer St. crossing at MP66, one mile south of MP65 where MR cabin was located. View NW towards MR and Manorville. 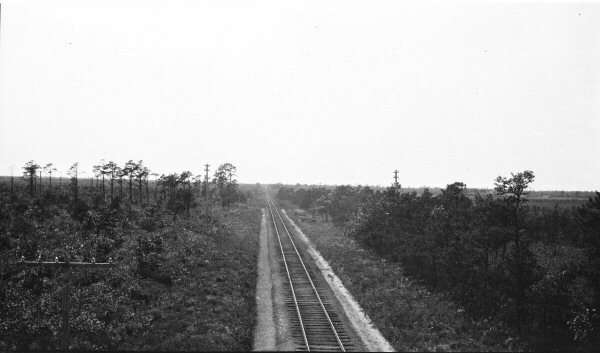 The signal cable running along the side of the tracks connected with MR cabin one mile away and was controlled from there. 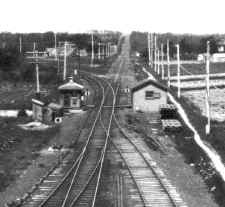 Way in the distance you can just about make out the white cross buck post for the crossing diamond for the Eastport-Manor Road crossing. 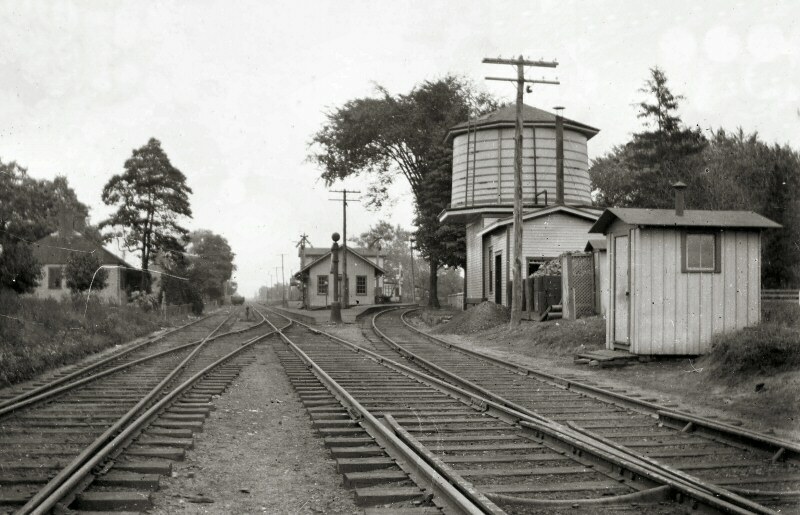 The signal was installed in 1927 and block operator James V. Osborne climbed to the top right after installation to get some nice elevated views of the branch. 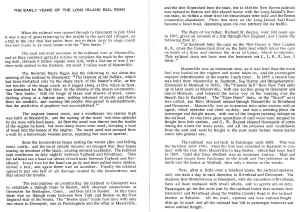 He wound up getting the only known views of the branch and, by being elevated, some of the best views of the ROW and rural LI in the process. H10s #108 is pulling an eastbound freight along the Montauk branch at the junction of the Montauk and Manorville branches at Eastport c. 1943 in this view looking northwest directly up the Manorville branch. 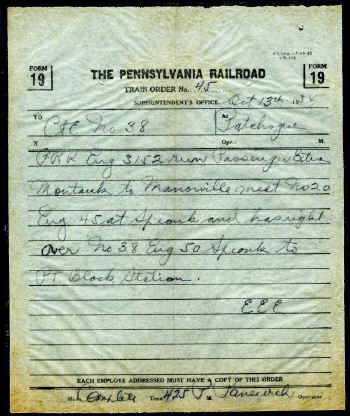 An indication that this was a wartime shot (and wartime photos were very rare because of the security policy that was strongly enforced) is the color of the smoke box. Smoke boxes of the locomotives during the war years were painted a dull, dark grey. They were painted a lighter grey/graphite after the war was over. 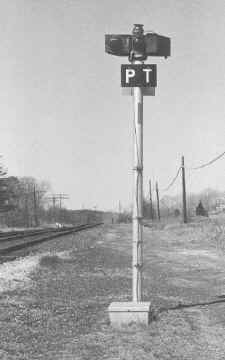 The locomotive is passing the "PT" unattended block limit signals. 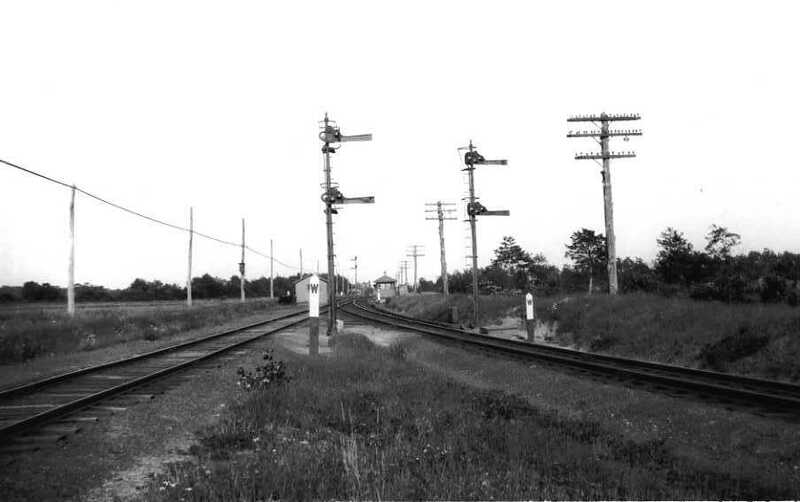 The old signal masts are still standing but have had their semaphore blades removed. In the foreground is the out-of-service "PT" cabin. Per the G.O. 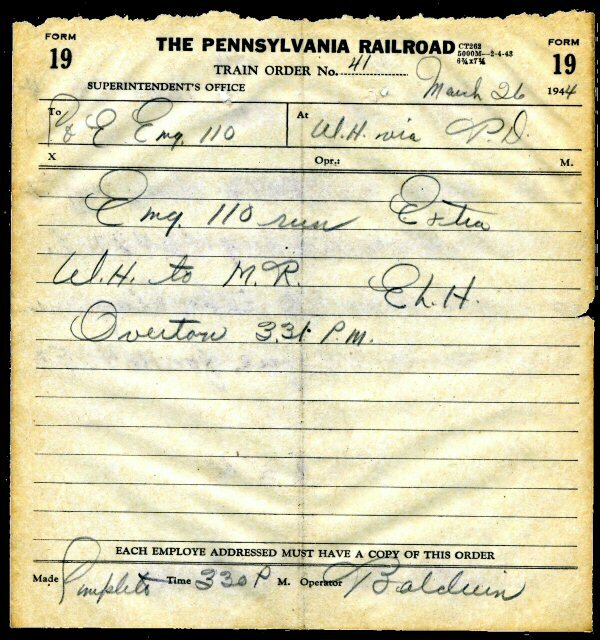 dates I have, the cabin was taken out of full-time service on January 19, 1933 and was open for summers only beginning on June 25 of that same year and was last placed out of service on September 9, 1942. 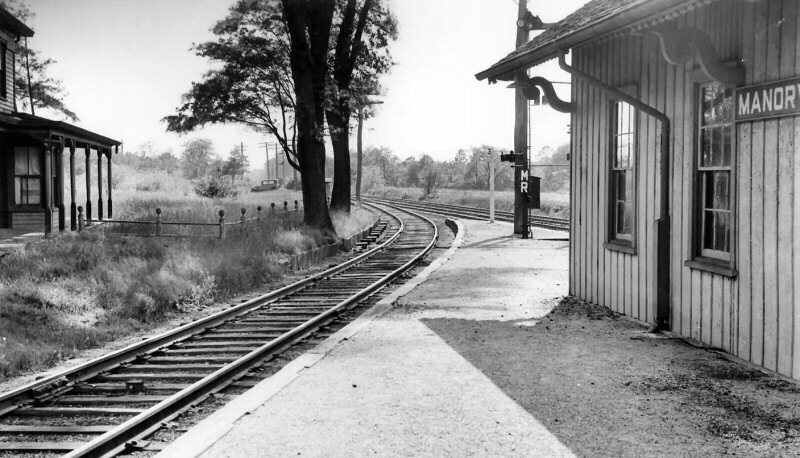 It WOULD have been necessary for the cabin to have been in service during the summers due to the number of trains running past this junction on their way to the Hamptons and Montauk however, beach and Hamptons traffic was probably significantly reduced during the war years so the cabin was most probably no longer needed after 1942 and by the time the war ended, the railroad probably had a notion to eliminate this junction which they did within a few years. 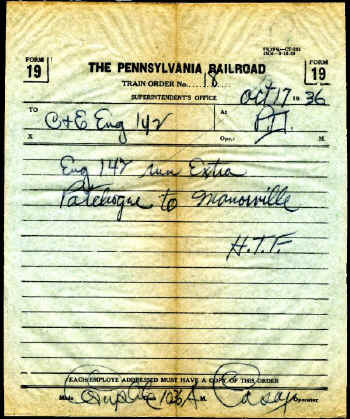 Train order issued at "PD" tower in Patchogue addressed to eastbound Montauk train #4, indicating that PRR-leased K4s #1984 was to run passenger-extra from "PW" interlocking which was west of Pinelawn on the Main Line to Montauk, which required using the Manorville-Eastport branch. 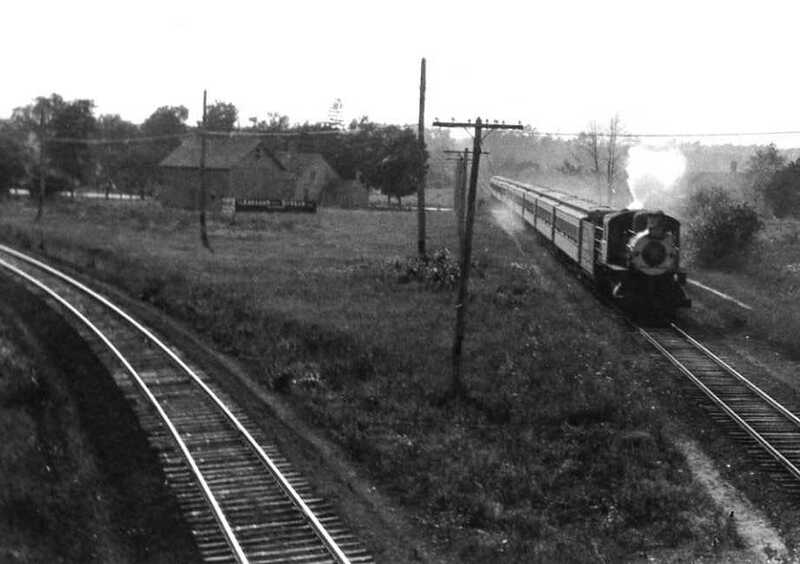 The extra was to run ahead of train #4 from "PT" (Eastport) to Montauk. The 200-series train numbers indicated Main Line scheduled trains. "EEE" at the end of the order represented Supt. of Transportation E. E. Ernest. Order made complete by block operator Gafney. 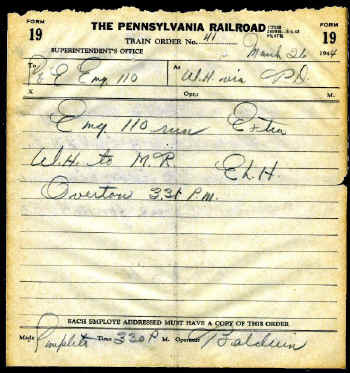 Train order issued at "PD" tower, Patchogue, addressed to eastbound Speonk train #38 indicating that PRR-leased E3sd was to run passenger extra westbound from Montauk to Manorville. 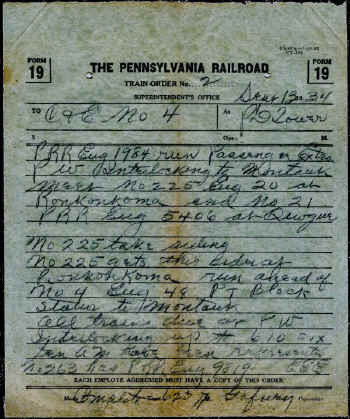 Order made complete by block operator Panevich. 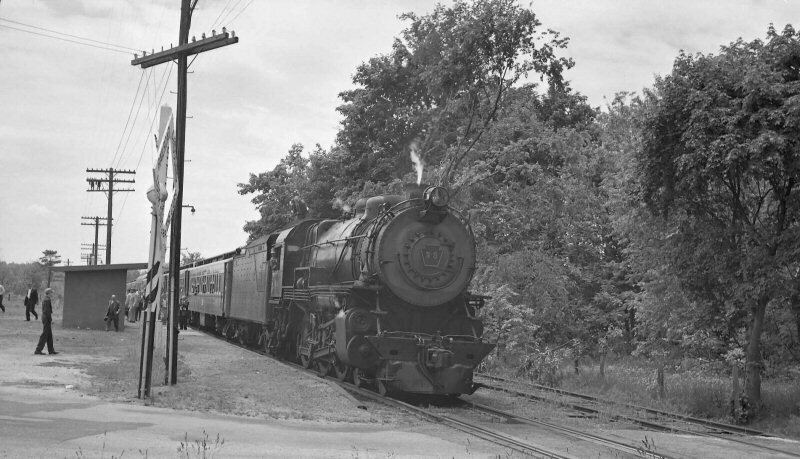 Similar train order indicating that PRR-leased K4s #5407 was to run passenger extra westbound from Montauk to Manorville. "HTF" at the end represented Supt. of Transportation H. T. Frushour. 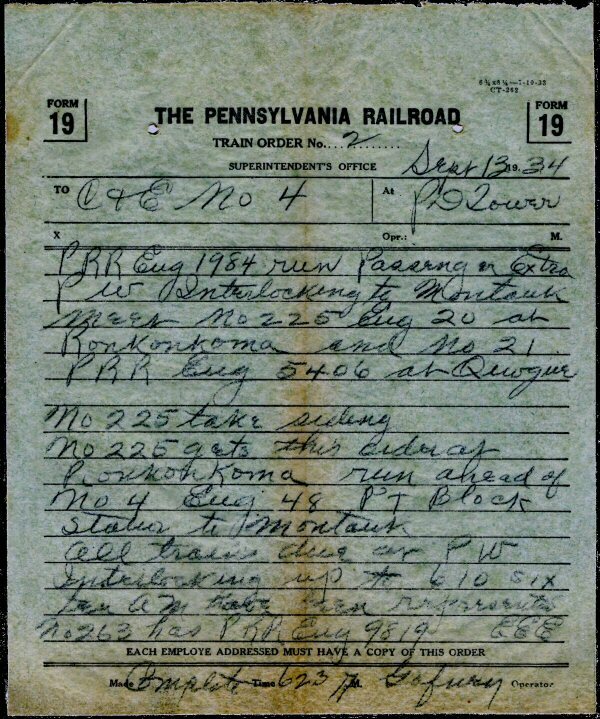 Order made complete by block operator Hawkins. 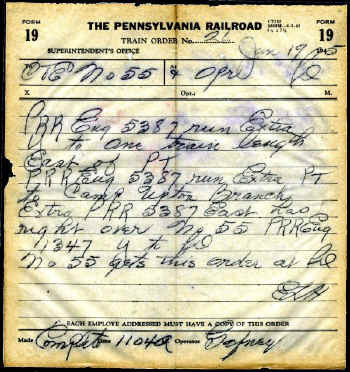 Train order issued at "PD" tower, addressed to G53 freight engine #142 with instructions to run extra (and light) from Patchogue to Manorville. 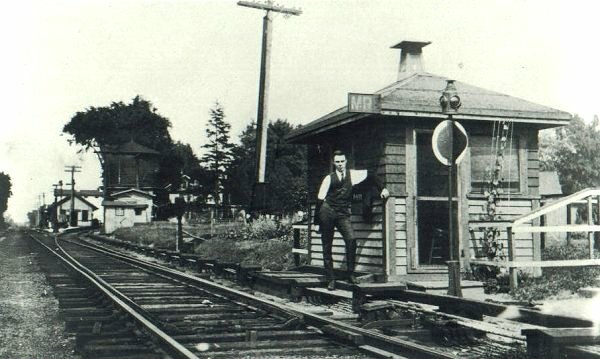 This required a reverse move at "PT" cabin in Eastport as the west leg of the wye that would have facilitated this move much easier had been taken out of service in February, 1931. Order made complete by block operator Casey. 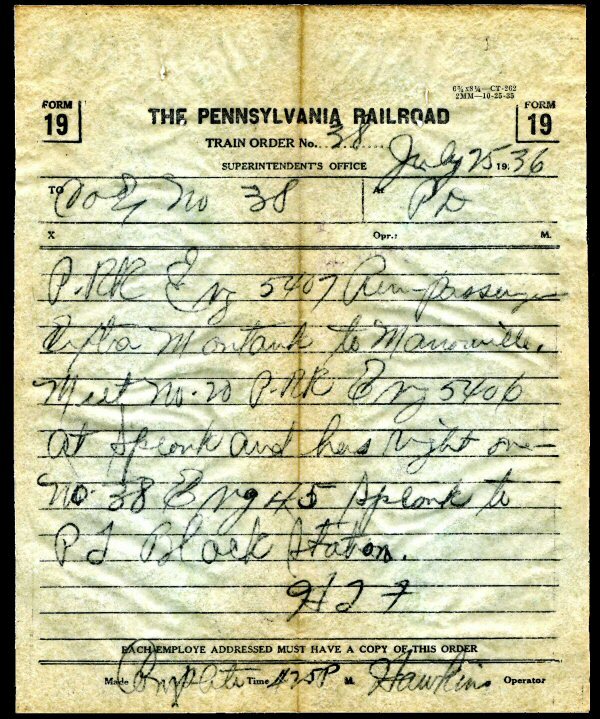 Wartime train order issued at "WH" (Westhampton) via "PD" in Patchogue addressed to H10s freight engine #110 to run extra (and light) from "WH" to "MR." "MR" was the block signal at the Manorville end of the Manorville-Eastport branch. "MR" cabin had been taken out of service by this time. "ELH" represented Supt. 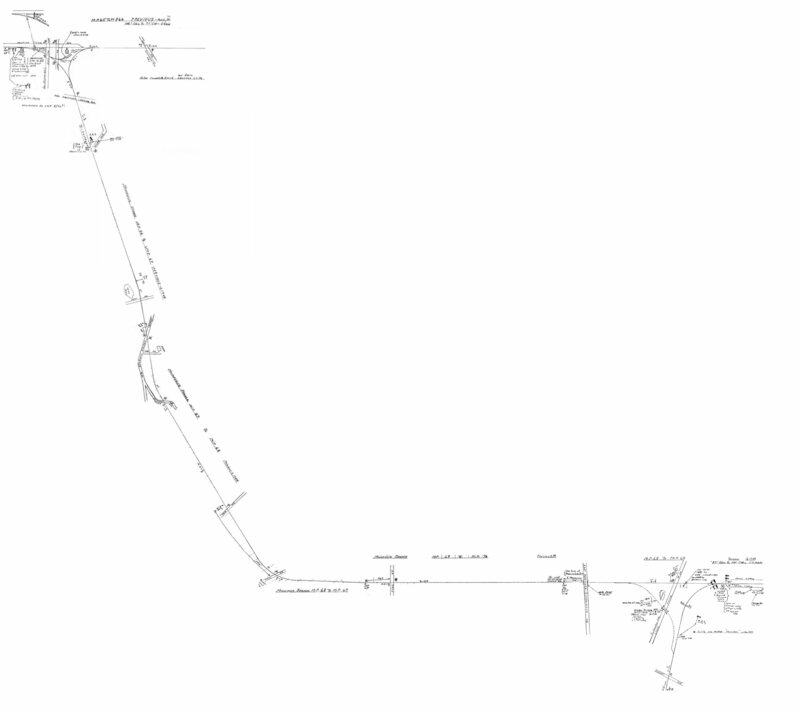 of Transportation E. L. Hofmann and the order was made complete by block operator Baldwin. It is noted that the order was relayed to Conductor Overton who received this order via telephone in a LIRR "T" box at Westhampton. 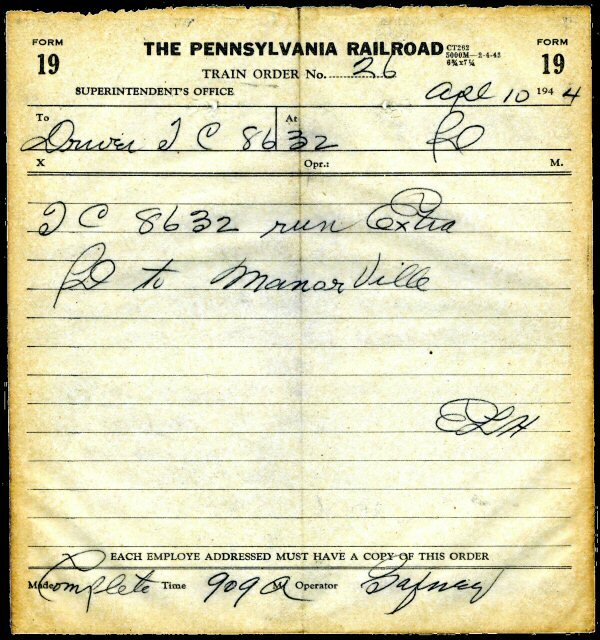 Wartime train order issued at "PD" tower, addressed to the driver of Track Car #8632 directing the unit to run extra from "PD" to Manorville. 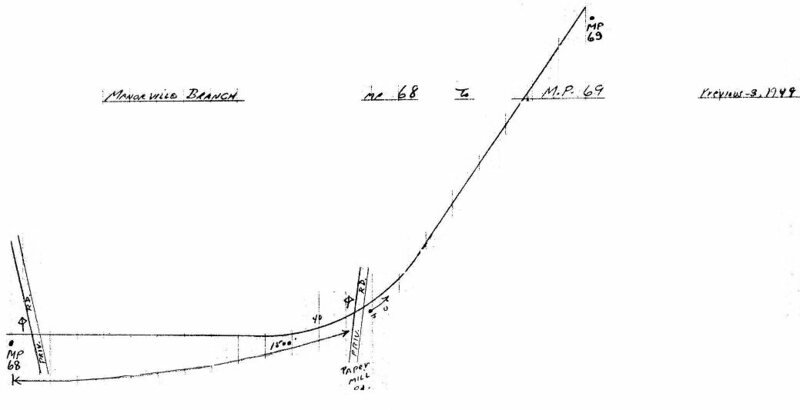 Again, like the earlier order, this would required a reverse move at "PT" in Eastport. Order made complete by block operator Gafney. 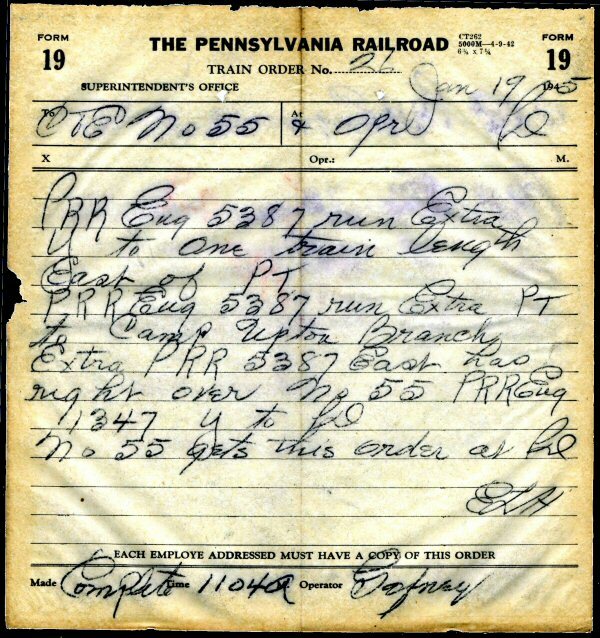 Wartime train order issued at "PD" tower, addressed to westbound train #55. PRR-leased K4s #5387 is ordered to run extra from "Y" cabin (end of double track east of Sayville) to one train length east of "PT" (Eastport) to allow it to clear the switch, where it's to make a reverse move and run extra westbound up the Manorville-Eastport branch to the junction on the Main Line where it will then continue westbound to the Camp Upton branch east of Yaphank. Obviously a troop-train move. Order made complete by block operator Gafney.